Flowers, seeds and leaves of Culinary Myrtle plant, Myrtus communis, are rich in Vitamin C, Malic and Citric Acid. The leaves have been used as a spice and herb in a similar manner to Bay Leaf. Used in salads, cooked in meat dishes and utilised in cosmetics. The fresh juice is used to stimulate mucous membranes of stomach. Main ingredient of the sardinian drink Mirto. Attractive house plant. Suitable to grow in containers. Culinary Myrtle plant is a native of the Mediterranean region and is adaptable to most soils and positions. Frost resistant but drought tender. 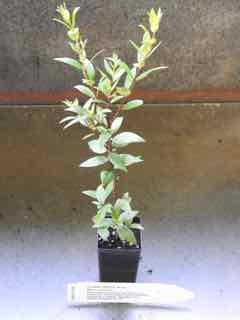 An evergreen shrub, growing to 4m x 2m. Be the first to review “Culinary Myrtle, plant” Click here to cancel reply.